As reported here on Techlicious, phone scams are on the rise. In the new “One Ring Phone Scam,” crooks create a missed call notification to a premium-rate phone service, hoping to trick you into calling a $9 per minute international chat line with a $19.95 call fee. The scam works because the scammer’s number isn’t in your smartphone’s contact list. But what if it was? What if your phone already knew the scammers’ phone numbers, crowdsourced from people like you from around the country? That’s the idea behind Truecaller, a smartphone caller ID app. With Truecaller, when a telemarketer calls you, you’ll be warned before you pick up the phone that it’s a spam call so long as one of the app’s 40 million users have already reported it as such. It’ll also give you info on legit callers, too. And, of course, there is a block feature. When you first install Truecaller, you’ll be asked to provide your cell phone number and link the app to a Facebook or Twitter account. Given Truecaller’s nature, you’ll want to enter the app’s privacy settings (Settings > Privacy) to limit who can have access to your contact information by searching your phone number – all callers, friends of friends or by request only. Naturally, the best way to block real telemarketers is to add your phone number to the Federal Trade Commission’s official Do Not Call Registry page. Doing so won’t block scammers, however. Adding an app like Truecaller (or a competing app like PrivacyStar) to your phone helps provide you with that extra protection. The Truecaller app is available for virtually all mobile platforms, but the live caller ID functionality is limited to Android devices. You can download it by visiting truecaller.com or via the Apple App Store (iOS) and Google Play (Android). Please help to install in my set. With all due respect, the DNC registry is worthless. I have been researching ways to stop spam calls for the last couple of years. I thought by now the ineffectiveness of the DNC was well known. Bot calls do not care about the DNC. I used to religiously report spam calls to the FCC’s DNC list. Then I realized I kept receiving calls from the same spammers. I Google searched the spam callers name and found they had been reported to the DNC for YEARS. The DNC is just another waste of taxpayer dollars. The benefit of the DNC registry is that legitimate marketers use it for marketing purposes to screen out those consumers who don’t want to be bothered. When you think about how few calls we get from “real” companies versus spammers, you realize that it does serve its purpose. What the DNC will not do is prevent illegitimate companies, scammers and spammers from calling you. These companies are already breaking the law in most cases by using robocallers or misrepresenting themselves - they’re certainly not going to check the DNC list to screen out who they’re calling. Going after these companies is the job of the FCC, which is not an easy task since they use cloaking technology to hide their origins, constantly shift phones numbers and, in many cases, are based offshore or use offshore dialing systems. Though there have been a number of cases where these spammers were successfully prosecuted. What we really need to change things is not more laws, but better technology to prevent these calls from getting through. The FCC has been researching this technology through various anti-robocall competitions. I think we all are anxiously awaiting the day that one of these technologies comes to fruition. If you still have an “old fashioned” land-line or VoIP “digital” phone service, look into No Mo Robo. I went from dozens a week to ZERO robocalls after joining their FREE service at www.nomorobo.com. All they need is your phone number when you create an account. To date, over 112 MILLION robocalls have been blocked!! How do I block callers whose number isn’t showing? We cover various blocking options in this article: https://www.techlicious.com/how-to/how-to-identify-block-telemarketers-on-your-android-iphone/. However, many of the apps no longer seem to be working as well as they used to and calls that should be blocked are still coming through. We really need the phone companies to get their butts in gear and fix this problem at the source. I use Mr. Number and Whitepages ID together on my android and they work great. Haven’t been able to download either on the iPhone but may just not know how. 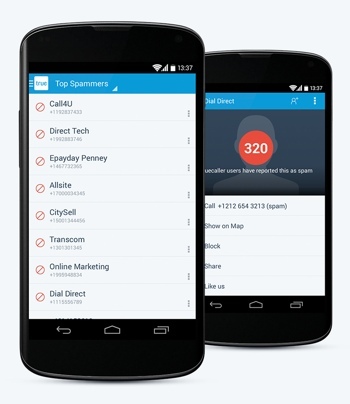 truecaller.com is for both. I’ll be loading truecaller.com on the iPhone and trying it out.